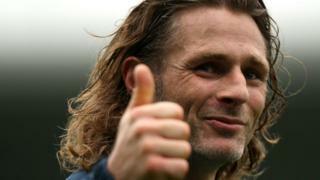 Wycombe caretaker manager Gareth Ainsworth tells BBC Three Counties Radio he has not been given any clues as to how long he will have the job. Ainsworth was put in charge of the team after Gary Waddock was dismissed following last Saturday's 1-0 home defeat by AFC Wimbledon. He is also the lead singer of a band called Subrosa5 and shares a joke or two about his love of rock music.